Ever since I fell in like with American “art pottery” years ago – with the wonderful tile work that those companies produced at the turn of the twentieth century – I’ve been a big fan of tile work all over the world. I’ve mentioned in previous posts that if I wasn’t a painter I would love to be a ceramic artist, especially with the painted-on-design part. However, what I can do is sit back and admire the work of ceramic artists through the centuries. Some of the most gorgeous tile work ever has come out of the Middle East. Need I mention the buildings in Isfahan, Iran, covered in gorgeous tile work? I came across this tile lunette while working on a Discovery Series set on Safavid art. In the centuries before book illustration became the important medium for pictorial representation, ceramics were one of the major vehicles for representation in Islamic art. 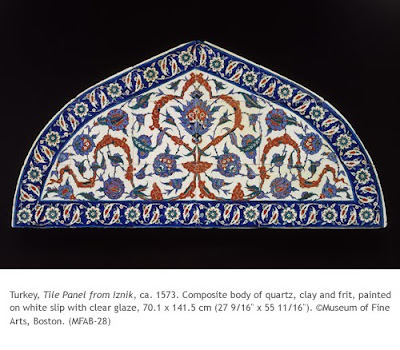 Even after book arts’ primacy was established, the decorative arts continued to demonstrate the high level of sophistication of Islamic artists. It was not until the Islamic medieval period (10th–12th centuries) that a highly abstract and fully developed style emerged, featuring that most original and ubiquitous pattern often known as "arabesque." That term was coined by someone in Napoleon’s army when he invaded Egypt and saw the beautiful tile work there. With the Mongol invasion of western Asia in the 13th century and the establishment of a Mongol court in Iran in the 13th and 14th centuries, numerous Chinese motifs and patterns were adopted, though sometimes in markedly revised form. This lunette, intended for a building that the Museum of Fine Arts in Boston does not identify, clearly shows Chinese influence. The flat, stylized floral patterns formerly adapted from Byzantine art, here are more “fleshed out,” although the flattened, frontal view persists. The 16th century is considered the golden era of Ottoman (ca. 1281-1924) art. Between the 16th and 17th centuries, ceramic arts flourished in the Ottoman Empire as never before. Under the Ottomans, the city of Iznik thrived as the main center of supply for ceramic tiles for decorating the many buildings commissioned by the rulers. Orders for architectural tile peaked during the seventeenth century.